OK now let’s begin with our Bitcoin Code review in detail to find out what is Bitcoin Code in real. 3 Can you trust Bitcoin Code Software? Bitcoin code is most probably a scam, which allegedly claims to make approximately $13,000 to its Bitcoin Code members for free. It also claim a 99.4% level of accuracy and told us that only 7 spots are remaining. This is how gullible individuals are brought into this equation. Let’s think generally. If Bitcoin Code pay upto $13,000 in 24hours guaranteed profit to its members, then why are they giving it out this secret software for free to several people instead of simply requesting for a license fee. So, why aren’t they doing that. It is because their business model is not real and completely an affiliate scheme where they are get paid for referring ”Fresh Blood” to an online broker via a piece of software. Once you deposit your money to one of their chosen brokers via their software, the robot will trade on your account and lose all your money on loosing trade. The owner details of Bitcoin Code is also not clear. Of course, who want to come upfront if their intention is to rob people at last. Like other scam sites, Bitcoin Code resort to the use of fictitious character as the owner of this Bitcoin Code Software. Steve McKay is indeed not the owner of this software. The picture you see is a stock picture and person is not an ex-software developer and knows nothing about this Bitcoin Code App. Lots of scam sites in the past had already used such fake pictures to make people confuse. Actually, it is very easy to get a stock picture online for free and then you need to make some little changes and add your prints to make it look authentic. 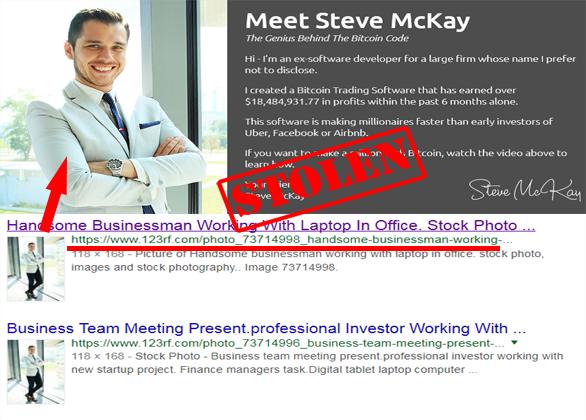 More than that, there lots of companies who had already scammed people in the past were using pictures of the so called founders which proves having that on there website doesn’t stop any company to scam people. Bitcoin Code is claiming that they can pay such huge profit rate daily by using the money invested by members in cryptocurrency trading. Well, this claim itself is a bogus claim, every cryptocurrency traders know the fact that no one auto trader can make constantly every day 94% win rate on those trading. 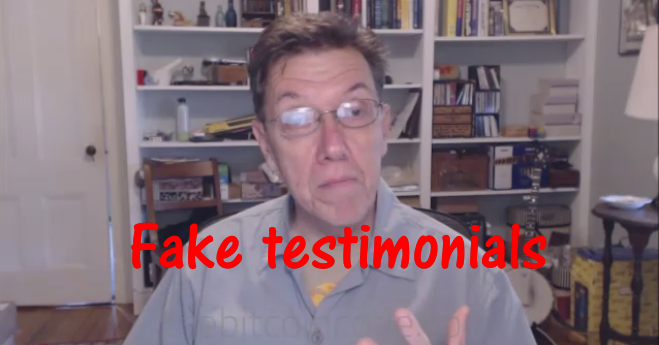 Just a moment after the video starts playing, you will see floods of fake testimonials painting positive image of TheBitcoinCode.com. This is a trap to get you interested in the Bitcoin Code in a short time. The people giving those testimonials are paid actors, used on a bunch of other sites and if you were careful enough you will notice that the testimonials were scripted. Scammers never really do learn in this regard, do they? Can you trust Bitcoin Code Software? No. Their claims are unrealistic, and they look, feel and act like a scam. Also, the photo of the person claimed to be the creator of this operation is not real. With Bitcoin Code, you are essentially allowing a dumb software to wreak havoc on your trading account. Again: such profit potentials advertised by Bitcoin Code has not been feasible for years now. Bitcoin Code is a scam. Do not let these people make use of your hard earned money on a worthless software, to trade on a broker they will happily collect commission from.